221117 Sir Henry Morton Stanley sweeps round the curve to the north of Tackley on 20 July 2002 with the 1O09 08:19 Manchester Piccadilly to Bournemouth 'Pines Express'. 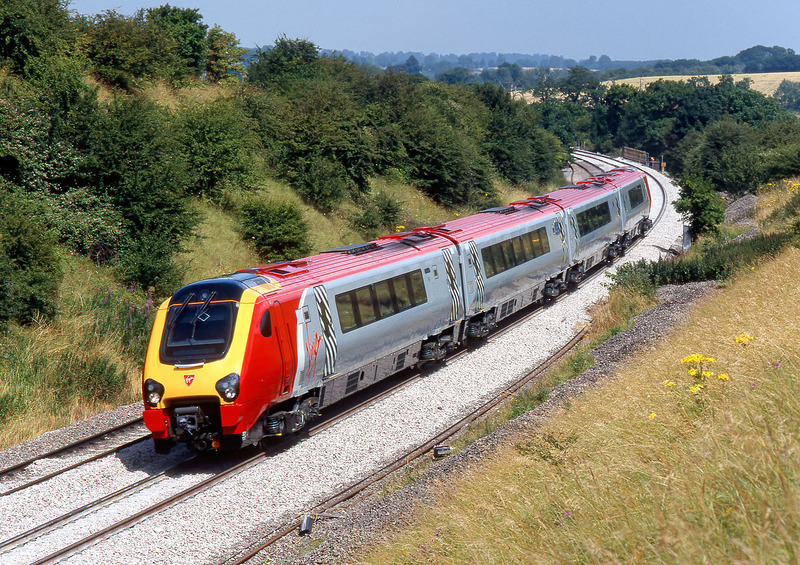 This is a historic picture, not only because the red and silver Virgin Trains livery has long since been replaced by the drab brown CrossCountry colour scheme, after the franchise change in 2007, but because it shows 221117 running as a four car set. Along with a number of five coach Class 221s, 221117 entered service with just four vehicles. 221117 is just three months old in this picture, which explains its clean appearance. The fifth coach was added in November, meaning it ran in this configuration for just seven months.